The cutlass is the famous sword of the high seas. The cutlass was quite a good working sword and was carried on land and sea but was most popular and remembered as a sailors sword or better still the sword of the pirates. The cutlass was a shorter sword and may be known by some as a cuttoe from the french referring to the sword as having a machete style blade (couteau). It was also referred to as a �hanger� until the 1800's, then adopted the name cutlass amongst sailors. This sword is thought by some to be a descendant of the medieval falchion. Both of these swords had shorter length, and wide blades but the cutlass wouldn't normally have a cusped tip like it's predecessor. The cutlass had a few variations of guard from an intricate basket, but more commonly a solid basket or simple d-guard with some minor embellishments offering a little more hand protection. The guards purpose wasn't strictly a defensive part of the sword as it's name suggests. It could be used for a non-lethal attack while protecting the wielders hand from injury. 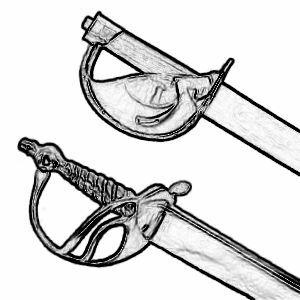 Two common hilt shapes are pictured below. The hilts were often crafted from brass because of its corrosion resitance to sea water. The cutlass was generally a slashing sword. It's short length and curved wide blade made it very effective. It could be used for thrusting as well but that wasn't it's strong suit or it's design. The cutlass was not only used as a weapon. In some areas this sword would be used to clear brush and cut sugarcane in the central American rain forest regions because of its machete style . The cutlass was appealing to sailors because of it's versatility. It was an effective close quarters fighting sword that was efficient above and below deck where larger length swords would be cumbersome and difficult to swing. When not in a skirmish the sword was a great tool day to day for cutting rope, canvas and was even robust enough for chopping wood. The pirates made this sword famous and it was well written about for centuries. It's known to have been carried by some of the most notable pirates Captain William Fly, Captain William Kidd and the �Gentalmen Pirate� Stede Bonnet. Historians have recorded their use by pirates as far back as 1667. The pirate knew full well how to take advantage of every part of this sword from a tool aboard a ship, hacking through the jungles and effectively as a weapon during a boarding. The crew unsheathing their swords as an intimidation was often enough to capture a surrendering vessel. Strike with the basket or flat of the blade were common uses as well if any of the captured crew were to get out of line. The cutlass wasn't only carried in the �age of sails�. It was a popular sword in some of the most powerful modern navy's of the world. Britain's Royal Navy's landing parties carried the cutlass as late as 1936 when it was finally demoted to ceremonial status and remains a part of the formal dress during parade and by the Chief Petty Officer during a court martial. The United States Navy listed the cutlass as an official duty weapon as late as 1949. It was just recently approved in 2011 for Chief Petty Officer's to once again include and wear the respected naval cutlass as a part of the ceremonial dress uniform. The cutlass is a remarkable sword and appears it will retain it's official status for sailors worldwide for many years to come.